The concept of water loading is been around for quite some time now. The idea is to first drink a huge amount of water, some athletes drink even more than 10 liters a day, followed by a water restriction. Bro-science shows that athletes continue to urinate even though they don’t drink those large amounts of water anymore with the result that they actually lose a lot of water weight. Up to a year ago, there was no actual research that proofed this anecdotic effect. Last year high-quality research by the Australian Institute of Sport shed some light on the matter. They divided 22 well-trained grapplers into two groups. The water loading group drank 100ml per kilogram body weight a day for 3 days. The control group drank 40ml per kilogram per day, which is considered to be a normal amount. Except for the amount of water they drank the circumstances they lived in where equal and their diet was calculated and controlled by a dietitian in the institute. All athletes followed a mild energy restricted and reduced residue diet. After 3 days both groups restricted their water consumption for 1 day in which they drank 15ml per kilogram. The result was that the water loading group significantly lost more weight, in average 3.2% body weight, compared to the control group who lost in average 2.4%. This weight loss is likely to occur because of an adaptation in hormone balance. When drinking a lot of liquid the body produces a hormone to get rid of the excess liquid. The level of this hormone is not immediately altered when on the 4th day you drastically reduce water intake, therefore you continue excreting more liquid than in a normal situation. However, this is still a theory and needs further research. During the intervention, both groups actually lost already ~1-2% of body weight before the water restricted day started. This is likely because of the mild energy restriction and the low residue diet. Other researches showed that keeping low fiber diet for a few days can cause a weight loss of about 1,5% body weight, but those researches are not directly linked to weight cutting for sports. The likely reason behind this weight loss is a reduced amount of food that remains in the gut. 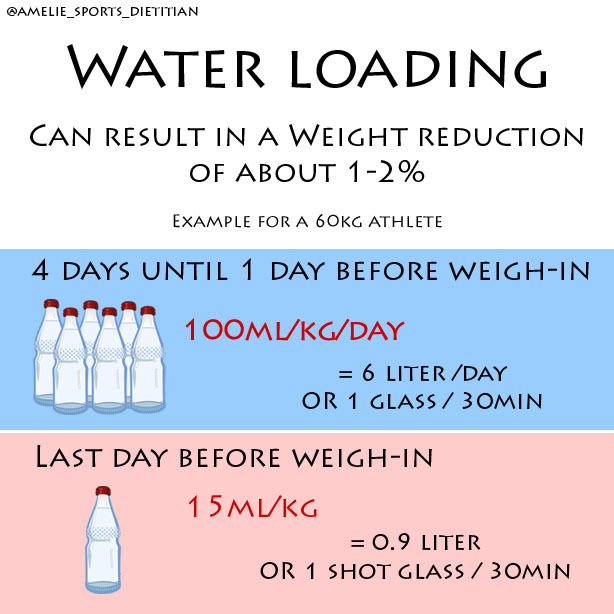 Water loading can be an effective method to lose water weight. 100ml/kg appeared to be safe when evenly spread over the day. However, when you drink large amounts of water at once you risk water intoxication which can cause death. Stop the water loading when you experience the following symptoms: nausea, headache, confusion, restlessness and muscle weakness.